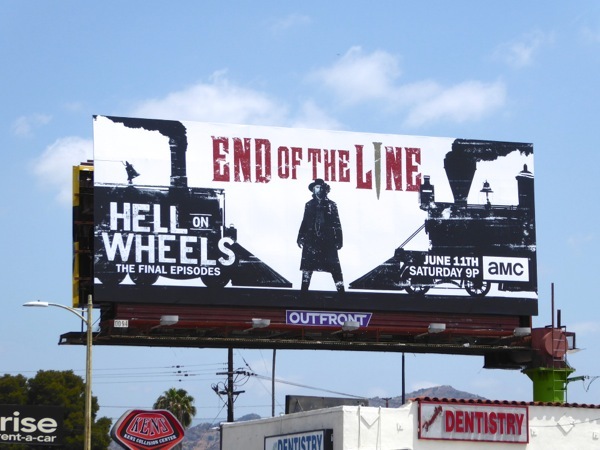 All aboard folks, it's time to take one last wild ride with Hell on Wheels fifth and final season. 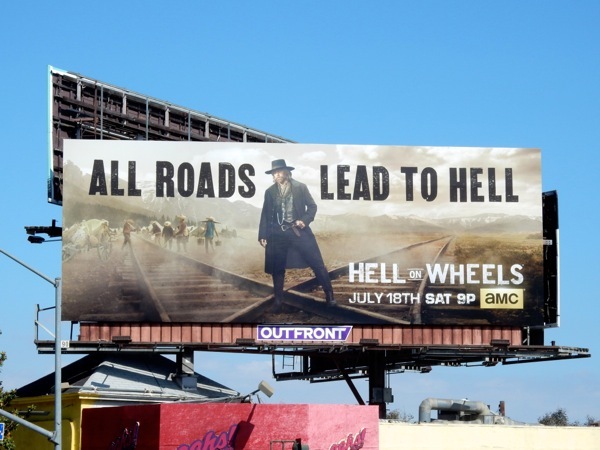 'Cullen Bohannon' (Anson Mount) is back to keep building of the Transcontinental Railroad moving forward and not even the imposing Sierra Neveda Mountains and a new workforce teeming with thousands of Chinese immigrants bringing their own language, culture, traditions and problems, can slow progress. 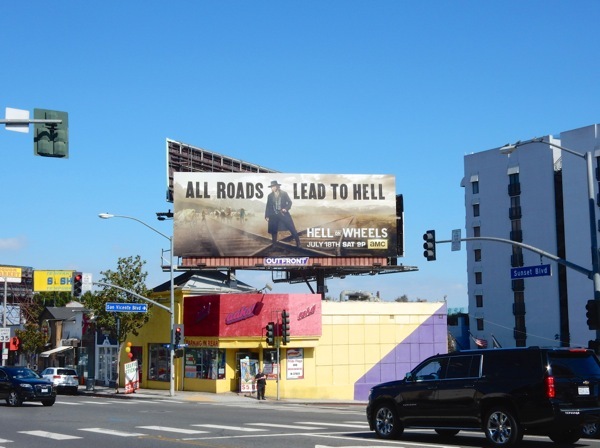 These ominously titled 'All roads lead to hell' billboards, with Cullen standing at a dusty crossroad of railway tracks, certainly catch your eye and were snapped in multiple locations along Sunset Boulevard from July 9 to July 13, 2015. 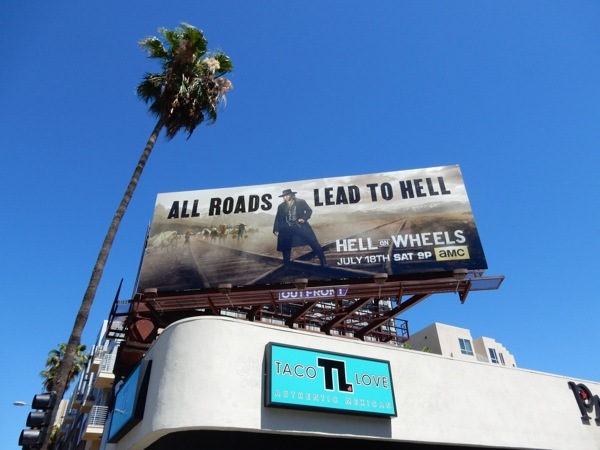 This time last year Anson Mount described Daily Billboard as a "Weird, but interesting idea" on WhoSay, so let's see what the star thinks this year. 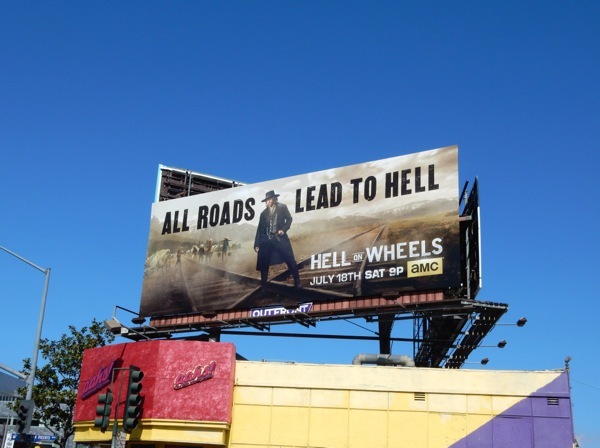 If you're a fan of the AMC Western drama, be sure to also check out all these previous season promo billboards for Hell on Wheels. Are you ready for one final journey through America's post-Civil War world of greed, corruption, grit and gunfire? And most importantly, will this railroad finally be completed? UPDATED: AMC has taken a leaf out of Hollywood studios of late by splitting their final seasons in two, thereby making two smaller seasons to spread across the years. 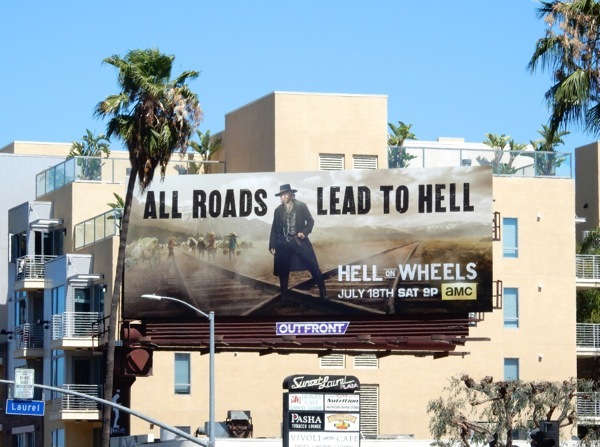 They did it with Breaking Bad and Mad Men, and now it's the turn of Hell on Wheels. 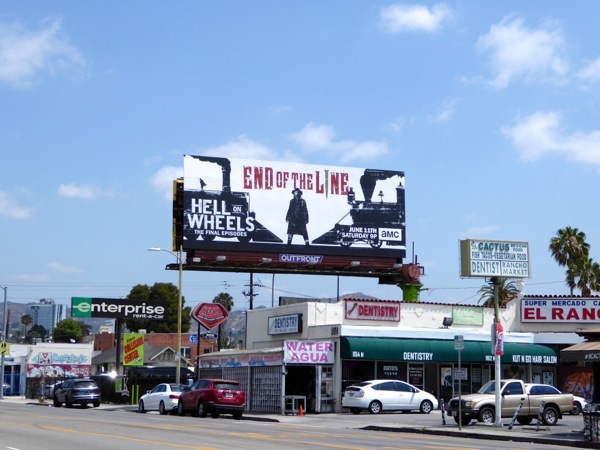 It's the 'End of the line' for the Old West railroad drama and this final episodes billboard was spied along L.A.'s Vine Street on May 26, 2016.